Three Cupcakes: Mayer, Smith, and Pettis with their open source 3D printers. “This is the Wild West of 3D printing,” Bre Pettis explains as we stand inside the so-called “Bot Cave.” This warehouse space in downtown Brooklyn, N.Y., is home to MakerBot Industries, an open source hardware startup with the mission of making the dream of desktop fabrication a reality for every person on the planet. More hackerspace than superhero lair, the Bot Cave and its shelves are full of electronics, packing materials, and prototype machines. Something about the place has that feeling of a secret hideout, even if the high-tech superhero vehicle in the garage is a single-speed with drop handlebars. The fledgling firm is in the business of making kit-based 3D printers. Also called “rapid prototyping” or “fabbing,” 3D printing is a catchall term to describe a group of technologies that are used to translate virtual 3D plans into real objects. Unlike computer-controlled milling machines, which start with a block of material and whittle it down into a final form, 3D printing involves building up layers of material. This additive process is commonly achieved in one of two ways: powder bed or extrusion. In the powder bed method, a toolhead deposits a binder selectively across a bed of powdered build material, then lowers the bed and sweeps over another layer of loose powder. This process repeats until the object is complete, at which point it can be lifted from the vat of loose powder and dusted off. In the extrusion method, the toolhead deposits a thin filament of heat-softened material (usually ABS plastic) in layers that harden as they cool, building up a finished object. Samples of the CupCake’s output, available in cream and black. 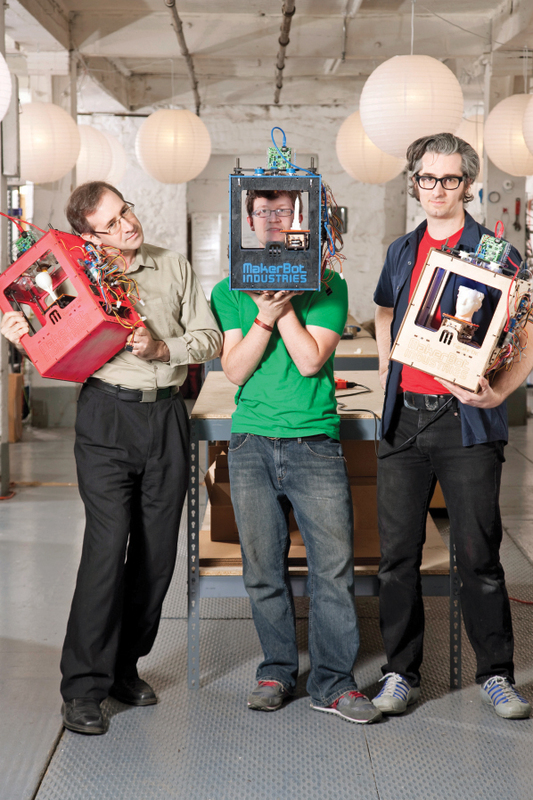 Zach “Hoeken” Smith, Adam Mayer, and Bre Pettis founded MakerBot Industries less than a year ago. All three men, who met through Brooklyn hackerspace NYC Resistor, have been active in the DIY community for the past five years (Pettis produced videos for MAKE in years past). The first prototype of the CupCake CNC, MakerBot’s flagship 3D printing machine, was finished just in time to bring to Austin’s SXSW music, film, and tech conference in March 2009. Pettis spent the weekend printing plastic shot glasses, and, thanks to lots of positive press and enthusiasm in the online DIY community, by mid-April the three had shipped the first batch of 20 machines to the eager hands of early adopters. Hoeken, Mayer, and Pettis quit their jobs and lived on savings for the first ten months of the operation. Friends Adrian Bowyer (of the RepRap Research Foundation) and Jakob Lodwick (founder of Vimeo) provided seed money, and since then the business has grown steadily. By year’s end, the batch size had increased from 20 to 150 machines, with one batch shipping approximately every month. The basic kit sells for $750. The technology behind the Cup CNC is similar to the RepRap, the first open source 3D printer, which was designed specifically to be able to replicate its own parts. The CupCake uses the RepRap motherboard, which Smith, 26, designed. It uses his own Sanguino microcontroller platform, itself a compatible derivative of Arduino. During the design stage for the machine, Smith, Mayer, 35, and Pettis, 37, prototyped parts for the CupCake on NYC Resistor’s laser cutter. They worked round-the-clock, settling on a design by the end of their second case of ramen noodles. Unlike RepRap, whose toolhead moves around depositing plastic on a stationary platform, the CupCake extruder only moves up and down. The 10cm-square build platform moves laterally to spread the thinly extruded filament of plastic along in the shape of the layer being printed. Having a stationary toolhead minimizes power and size requirements, making the CupCake CNC significantly lighter than the RepRap. And it’s leaps and bounds smaller than “mainframe”-style rapid prototypers — so portable that people bring it to parties. The CupCake whinnies and purrs as it prints. Watching the machine — internally illuminated with LEDs for dramatic effect — is like sitting around a campfire. MakerBot ships the machine as a kit that includes motors, pulleys, circuit boards, and laser-cut plywood, which means you build it yourself. They accept pre-orders and ship machines in batches. As owners of previous batches build and use their machines, they make suggestions and improvements to the design of the machine. These improvements are implemented in future batches, and are made available to current users as an upgrade. While the first batches required the painstakingly tedious task of soldering many surface-mount ICs to the motherboard, the latest CupCakes ship with completely assembled electronics, taking a lot of the effort out of the assembly process. The machine comes together like Ikea furniture; it’s assembled with little more than an Allen wrench. The CupCake CNC is the first of its kind in its field. Pettis confidently compares it to early personal computers like the Altair and Apple I, citing the hack-it-yourself hardware and savvy user base of enthusiastic tinkerers. Where previously having something fabbed required the use of large mainframe-style machines housed in restricted-access research facilities, building a CupCake CNC moves the mainframe onto your desktop. The types of items that the CupCake CNC can make are similar to those of a traditional 3D printer, but the paradigm is completely different. The level of user engagement with the nuts and bolts of the technology is much deeper, and the cost is much lower. MakerBot operators communicate through groups on Google and Flickr, and rely on each other to solve problems and help keep their machines running smoothly. This distributed support network means less customer support for the three founders to maintain — although they admit to answering many hours of support emails daily. A parallel project, Thingiverse, is helping the MakerBot community thrive. Launched by Smith and Pettis in summer 2008 as a website for sharing laser cutter source files, Thingiverse was easily expanded for sharing 3D files as well. The design of the site encourages the same iterative process used to design the CupCake in the first place. Thingiverse allows users to create a page for a “thing,” which contains machine-readable plans for cutting or printing, pictures or renderings of the thing, and instructions for creating your own. Users can then post their own versions of the thing, or even make improvements and release a derivative thing, which is linked to the original. Users far and wide can share models for printing. For example, user Zaggo in Offenberg, Germany, posted a model of a whistle, and half an hour later users in New York held the freshly printed object in their hands, hot off the ’Bot. Discussions ensue on each object’s page about assembly technique or future revisions. Since problems are solved collectively and publicly, the community benefits. Different versions of the CupCake CNC kit are available to fit the needs of folks who already have some of the components on hand. If you already have access to a laser cutter or CNC toolhead, you can pick up a kit that comes without the laser-cut body pieces, or buy just the extruder. The machine’s modularity and its open plans make it attractive to tinkerers who are turned off by hacker-unfriendly “black box” technologies. Open source modeling for 3D printing is also in development. In hacking circles, the standard (closed source, expensive) 3D modeling platforms like Maya and SolidWorks are slowly losing ground to free, open packages like Art of Illusion and Blender. Regardless of how they make their models, however, most CupCake users employ Skeinforge (a clunky-but-free Python script) for slicing the virtual object into a set of layer-wise instructions for the plastic extruder and moving platform. Yet another open source package, ReplicatorG, is used to send these toolpath instructions to the machine for printing. It’s possible to circumvent the big 3D modeling software packages altogether by scripting objects entirely through mathematical rules. These scripted or “parameterized” objects can come about in two ways: a script either generates an STL file (the de facto standard data transmission format) to be sliced the same way as a standard model, or it generates the G-code to control the toolhead. The list of planned improvements to the CupCake CNC is long and exciting. What you can currently print is limited because of a lack of printable support material. Commercial extrusion-based printers have two extruders: one for the main plastic and another for support material, which is deposited where necessary to give the main extruder a place to put plastic that may overhang a previous layer. Implementing support material is a high priority for MakerBot, but it’s also a big challenge. When they were preparing for the Consumer Electronics Show this month, the three hoped to unveil electronics improvements like a new Arduino Mega-based motherboard, onboard USB support, and new microstepping motors for finer motion control. Other members of the maker community are getting involved, too. Charles Pax, a fellow NYC Resistor member, is working on ideas for a conveyor belt to carry finished objects away from the CupCake’s build area to help automate the printing process. But MakerBot’s goals don’t stop at the CupCake. Plans are already in the works for a desktop 3D scanner, which would pair with the CupCake CNC printer to create the washer/dryer combo of DIY fabrication. They’re also working on being able to print in PLA, a corn-based biodegradable plastic. The pièce de résistance, however, is an extruder that uses cake frosting instead of plastic. The Frostruder prototype is currently in its second revision; the days of CNC cupcake frosting are coming soon.